COLUMBUS, Ohio – Not sure if the dark speck that crawled across your desk at work was a bed bug? Wondering if the tiny insect you saw on the seat next to you at the movie theater or on the bus was a bed bug? How about that fleck you thought you saw on the corner of the mattress the last time you stayed in a hotel? A researcher at The Ohio State University has created a free new app to help you figure it out. 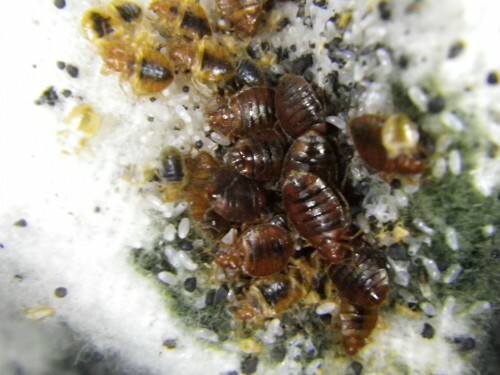 Jones is an authority on bed bugs having studied these pests for more than a decade. She is a founding member of the Central Ohio Bed Bug Task Force. Ohio has four major metropolitan areas ranked on this year’s list of top 50 cities with bed bug infestations, according to Orkin, a nationwide pest control company. Columbus ranks No. 5. Cincinnati comes in at No. 8. Cleveland-Akron-Canton holds the 13th spot, and Dayton ranks No. 32, according to the list. That’s because bed bugs, which are strictly indoor pests, can reproduce quickly, travel easily and survive starvation for many months, occasionally even a year, Jones said. Additionally, Ohio’s many large cities are in close proximity and are linked by major interstate highways, so bed bugs are easily spread far and wide, she said. With that in mind, Jones worked over the past year creating and writing the bed bug app. The app was funded through a grant from the U.S. Environmental Protection Agency via US EPA Region V pass-through funding to the Ohio Department of Agriculture, Division of Plant Health, and developed by EduTechnologic LLC. If you think you have bed bugs but aren’t sure, Chapter One: How to Identify Bed Bugs, can help you decide. Chapter Four: Preventing Bed Bugs explains how to avoid getting bed bugs in the first place. (Hint: Make sure that a bed bug inspection of second-hand items is part of your normal routine.) Chapter Three: Inspecting for Bed Bugs tells you how to do so. Chapter Nine: Advice for Residential Visits explains how you can safely visit people who have bed bugs in their homes and not bring the bugs home with you. “This information is relevant for social workers and first responders who go into infested homes or people with relatives who have bed bugs,” Jones said. “There is a difference between finding a single bed bug and an actual infestation,” Jones said. “People freak out if they see an insect they think may be a bed bug, and there’s often a general panic when there is a bed bug sighting at work or other public place. Check for bed bugs at hotels and refuse to stay in a room showing signs of bed bugs. Store luggage on a luggage rack after you’ve made sure it has no telltale signs of bed bugs. You can also store it in the bathtub to prevent hitchhikers. If you purchase secondhand clothing, keep it tightly bagged until you can wash and dry it. Treat as soon as you discover bed bugs, before their population increases or spreads to other homes. Don’t throw away your furniture unless absolutely necessary; it can almost always be treated. If you have no choice but to discard furniture, make sure to wrap it securely in plastic sheeting before moving it outdoors. Prior to wrapping it, be sure to damage or destroy the item, and also label it “Bed Bugs” so that others don’t reuse it. Don’t give away or share items with others until you have treated your infestation. Decontaminate your clothing and other washable items by washing them and then drying them for 30 minutes on medium to high heat. Items that can’t be washed but can survive the clothes dryer, such as shoes or stuffed animals, can be decontaminated in the dryer for 30 minutes on medium to high heat. Check your shoes before leaving your house so you don’t track bed bugs around. Don’t store your backpack, briefcase or similar items near your bed, and leave them in a sealed plastic bag or plastic tote when you go to work or school. At school, make sure children don’t intermingle their coats, backpacks, etc. These items should stay in individual cubbies, bins or other spaces. The app, which is available for Android and iOS devices, can be downloaded free by searching for “BED BUG FIELD GUIDE” in the App Store and Google Play Store. The app will frequently be updated with new information. April 22nd, Earth day, The Tick App – 2019 will be available in GooglePlay and iTunes! In two words, Lyme disease. 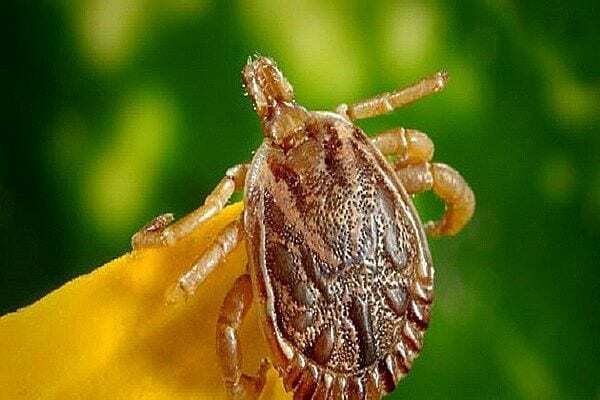 Lyme disease can be transmitted to humans after a tick bite. This study is designed to help us understand more about how people’s practices and activities impact their exposure to ticks. This research is being done because Lyme disease is the most common vector-borne disease (infections transmitted by the bite of infected arthropod species, such as mosquitoes, ticks, sandflies, etc) in the United States. The information provided will help us design integrated control strategies to prevent diseases transmitted by ticks. Why is my participation important and how is the app useful to me? If you live in a high-risk area, sharing your experience and perspective with us will help us learn about the risk factors for tick borne disease and design better methods that prevent tick bites and tick-borne disease. We really appreciate your input! We are also including information that will help you identify the different tick species, ways to prevent tick exposure and other information that will help you understand more about ticks and the diseases they transmit. Once you download the app and register for an account, you will be asked to take one enrollment survey that will help us capture your baseline risk of exposure to ticks. You will then receive a weekly to monthly message to start your tick diary during the high risk months (May to September). The tick diary, or activity report, should take less than a minute to complete. It asks if you or a household member encountered a tick and what you did that day. When you start the tick diary, you will receive a daily reminder until you complete 15 reports. Also, you can help us by reporting any tick through a quick form built in the app. If I don’t want to use the app, how can I participate? ODH is also reporting 17 La Crosse (LAC) virus cases and 2 unspecified California virus cases. Cases include 12 females and 7 males, ages 3-17, from 13 Ohio counties. The rainfall we’ve had this summer has continuously filled tree holes and containers with water, creating ideal conditions for tree hole mosquitoes (vectors of LAC virus) to breed. For more information about LAC and other arbovirus cases and surveillance data in Ohio, see the current Ohio arbovirus surveillance update at http://www.odh.ohio.gov/arboupdate. 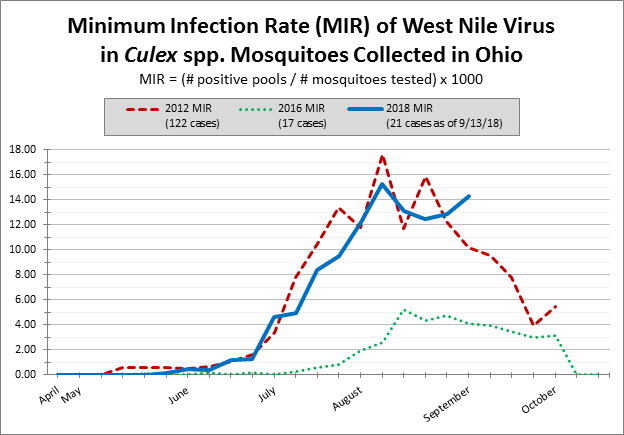 Surveillance season is beginning to wind down, but with continued warm temperatures and active infected mosquitoes, the risk of new infections will continue until we have a hard freeze. In fact, we have several suspect cases under investigation and we continue to receive new reports each week. With this in mind, please continue your community and public education efforts focusing on personal protection and source reduction. For more information, please check out our website at ohio.gov/mosquito or you can call the Zoonotic Disease Program (ZDP) at (614) 752-1029. 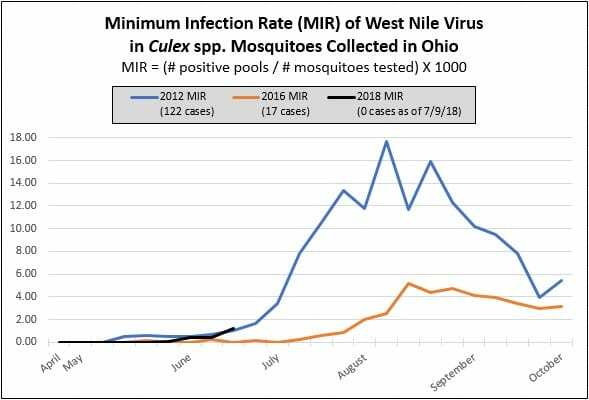 West Nile virus activity continues to increase and the statewide mosquito infection rate as of week 27 (week of July 4) is trending with infection rates we saw in 2012, our last epidemic year when we recorded 122 human cases. No human cases have been reported this year yet; however, 2 asymptomatic viremic blood donors were reported this past week, so there is evidence human infections have occurred. If you haven’t already, please be sure to increase your community and public education efforts focusing on personal protection and source reduction. For more information, see the current Ohio arbovirus surveillance update at http://www.odh.ohio.gov/arboupdate. 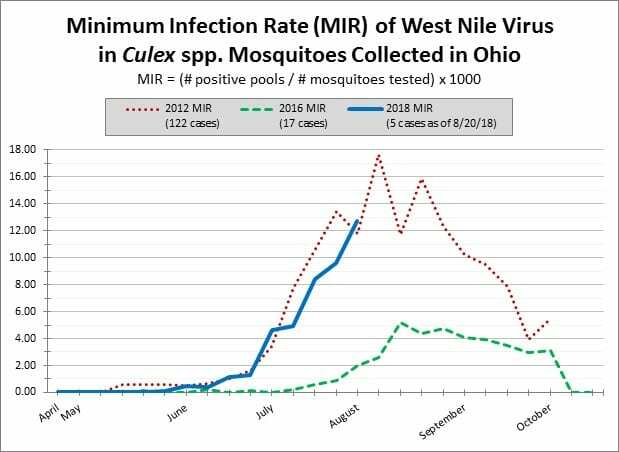 The data on this website was last updated on 7/16/18 and will be updated each Monday thru mosquito season. Please call the Zoonotic Disease Program (ZDP) at (614) 752-1029 if you have any questions. West Nile virus activity has been increasing, and it has now been detected in mosquitoes in 14 counties as of noon on 7/9/18. Of the 4,832 pooled mosquito samples (141,835 mosquitoes total) tested so far, 110 samples have tested positive from Athens (1), Delaware (1), Franklin (43), Hamilton (1), Hancock (1), Licking (4), Lucas (25), Portage (12), Richland (3), Ross (1), Stark (1), Summit (15), Tuscarawas (1) and Wood (1) counties. This is up from 26 positive samples reported in the last message. No human cases have been reported so far. For more information, see the current Ohio arbovirus surveillance update at http://www.odh.ohio.gov/arboupdate. 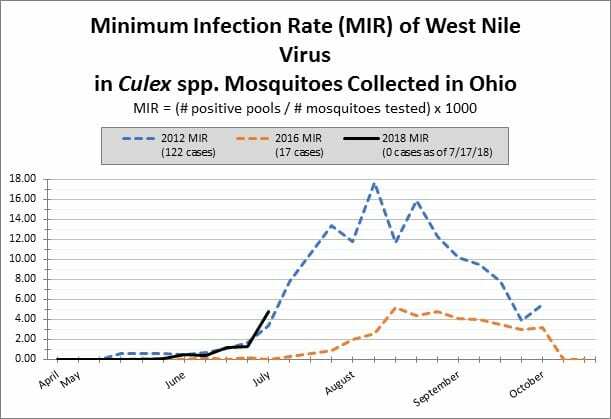 The data on this website was last updated on 7/9/18 and will be updated each Monday thru mosquito season. (TRENTON) – New Jersey Secretary of Agriculture Douglas H. Fisher today announced the United States Department of Agriculture’s National Veterinary Services Laboratory (NVSL) in Ames, Iowa has confirmed the finding of an exotic East Asian tick, also known as the longhorned tick or bush tick, on a farm in Hunterdon County on November 9. Initial identification was made by the Monmouth County Tick-borne Diseases Lab, located at Rutgers University and the Hunterdon County Division of Health. 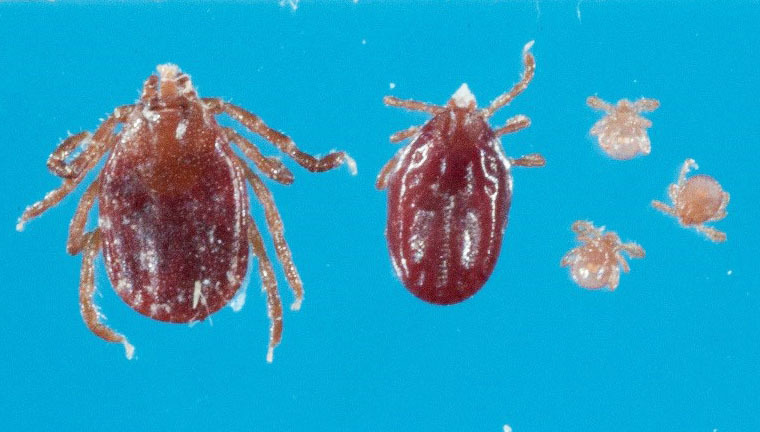 This tick is not known to be present in the U.S., although there are records of at least a dozen previous collections of this species in the country on animals and materials presented for entry at U.S. ports.